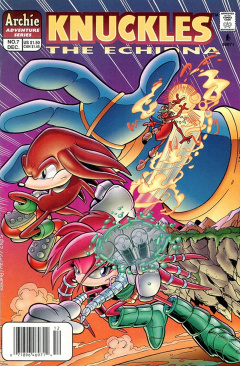 Knuckles the Echidna 7 is the seventh issue of the Knuckles the Echidna comic. This comic features one story: "Deadly Homecoming", the first part of the Dark Vengeance arc. An unknown being looks deep into a Chaos Emerald, looking for the great Dimitri. He finally locates the powerful entity, channelling his energy into him to provide a beacon to bring him back to Mobius. Now drifting in space in his satellite over the planet, Dimitri breaks free and uses the channelled power to fly back to the planet. In a desert on the Floating Island, a group of Dark Legion members convene at a stage where Kragok leads a presentation. In honor of the work he had done in the past, Kragok reveals a statue of Dimitri, as a symbol for the group to restore the echidna culture to their ideals. Suddenly, the statue explodes, with the real Dimitri standing in its place. He declares his return to the island, then notices the pieces of the statue that have fallen. He looks at the face, remembering his looks from when he was younger, claiming it to be acceptable. Kragok, confused and scared, asks him if he knew Dimitri. Dimitri responds by asking him to remove his faceplate for the answer. He does so, making Kragok realize that he is, indeed, standing before the great Dimitri. He bows down, while Dimitri claims the Dark Legion as his army, intent on taking over the world. Meanwhile, Knuckles, in another section of the island, sits on the edge of a cliff starring into the sun. Julie-Su arrives, asking if she can join him. He solemnly allows her, though tells her not to expect anything funny. She sits down, wondering why he is so upset, especially after his trip to Mobotropolis. Knuckles speaks up, saying that he was thinking about Sonic, then realized that he and Sonic have much in common, as both of their parents held many facts from them. However, Knuckles feels that everybody is keeping facts from him, making him seem like a puppet. With what he knows, he can only react to whatever occurs at the split second, making him long for the days when all he did was guard the Chaos Emerald. This makes Julie-Su speak up, as she mentions that nobody is talking to her. Whenever she strolls through Echidnapolis, she is greeting with stares or is avoided due to her history, when all she has wanted to do is to see where her family used to live. Realizing her problem, Knuckles gets up and helps her up from the cliffside. He takes her into the forest to find Archimedes to come up with an idea. The other issue is where exactly to find him. Archimedes arrives in Hawking's base, having been called by his grandfather Deo Volente. Deo notes that it may already be too late, that something dire has arrived. Before he can say what, the ground shakes, followed by the holographic appearance of Enerjak's head in the middle of the room. The ants react in shock as Enerjak reintroduces himself, then telling that that their disappearing acts will not work on him anymore. The ants try to run away, but Enerjak uses his mind powers to freeze them, as his whole body appears as a holographic projection. A thorn in his side, Enerjak encases the ants in balls of energy...then makes them disappear, as does his projection. In Echidnapolis, on a stormy night, General Stryker is summoned before the Echidnapolis council. As leader of the dingoes, he brings up the issue of housing of his group, as they are tired of sleeping in tents while the echidnas remain in their houses. The lead councillor, Darwin, tells Stryker that their construction crews are working as fast as they can. Stryker doesn't take much pride in this, asking the councillor how he would feel had the dingo city survived and not Echidnapolis during the return to the island. While Darwin contemplates this, one of the other councillors speaks up, asking Stryker what proof he has provided that his kind can be trusted in their city based on the past conflicts between their races. Stryker, first of all, demands to be called by his rank of General, then tells the councillor that the echidnas have the upper hand at the moment and that he cannot appease them anymore than he has so far. Darwin stands up, asking the General to have the dingoes lay down their arms to lead to better relations between the two races. Raising his arm in honor, Stryker agrees to as long as housing needs are met...crossing his fingers with the other hand behind his back. Knuckles and Julie-Su arrive in the Lava Reef Zone, a zone that Julie-Su is unfamiliar with as few dare to tread through it due to the natives. This concerns Julie-Su, but Knuckles knows how to locate them. She becomes confused as he starts to look through a bunch of bushes beside a lava pit, finding a fire ant. The ant is pleased to see Knuckles, asking him how he can help. Knuckles picks him up, wondering where he can locate Archimedes. The ant has no clue, even noting that his leaders are worried about both Archimedes and Deo Volente as they haven't heard from them in some time. Knuckles realizes something is definitely wrong, with Julie-Su thinking it is the Dark Legion. The ant, however, thinks it is something much larger than the Dark Legion. He puts the ant back into his hole, while he tells the two to watch their backs, as they leave to figure out what is going on. Back in Echidnapolis, rain continues to fall and lightning continues to flash, while Lara-Le stares out the window of her apartment with Wynmacher nearby. She is upset over thinking that Knuckles thinks he was an illegitimate child. Wynmacher tries to calm her, but she continues, recalling that she couldn't handle the responsibility that came upon Knuckles being born to the line of Guardians. Wynmacher hugs her as she weeps, comforting her that what has happened is in the past, that she didn't grasp the concept of royalty and a family that is pivotal to the echidna culture. He wipes a tear from her cheek, mentioning that they have now entered into a new chapter of their culture and that they will change, but he asks her if she will too. Taking his hand, she looks out the window, telling Wynmacher that she will talk to Locke. In the Rainbow Valley, Knuckles and Julie-Su looking for Espio. They walk through the dense and colorful forest, while a camera watches them go by. They arrive a tree, where Knuckles yells up to it; Espio's home. Knuckles doesn't hear anything, so he starts climbing up the invisible ladder into his home, confusing Julie-Su. He enters the home, finding it completely trashed. Now very suspicious of what is going on, Knuckles leaves the house, telling Julie-Su that they are going to go to Mighty's house. Despite what had happened during the arrival of Echidnapolis to the island, Hawking is still alive, now in Locke's chambers, unconscious and hooked up to medical equipment. Locke looks over his grandfather, writing notes as his father, Sabre, arrives, telling him to get some sleep. Locke feels he is doing fine, but Sabre notes that he isn't working to the best of his ability because of the lack of sleep, which could result in mistakes being made. Suddenly, the heart monitor connected to Hawking lets out an alarm as the echidna starts to have a heart attack. Locke, knowing that their equipment could overwhelm and kill Hawking, decides to try to connect with his grandfather telepathically to help him. He grabs Hawking's head and concentrates, eventually entering his mind. While floating through Hawking's mind, he sees that there is still a spark of life, and thus can be saved. However, a vision of Hawking appears before him, telling Locke that he had already done enough in his lifetime, but Locke doesn't think so, believing that Hawking's life is best preserved. Back in the lab, Sabre watches as his son struggles with the telepathic link. At the bottom of a cliff, Julie-Su aims a grapple hook for the top of the cliff edge. She fires, and fights to climb up the cliff edge with the grapple rope as a guide. She makes it to the top, tired, seeing Knuckles already at the top. He offers he help to get over the edge, but she does it herself. They look over at the edge of another cliff toward Mighty's house, seeing his door already open, a sign that more trouble has occurred. Back in the desert, a group of Dark Legion members work on one of their hovercrafts, noticing Kragok approaching them. Having been with Dimitri for the whole day, they think that they must've discussed something very important. He walks past the troops, entering a nearby tent to inform Dimitri of his troop inspection. Upon entering, he sees Dimitri hovering upside down in the middle of the room, glowing green and releasing many powerful bolts of lightning. The sight shocks Kragok, as Dimitri asks him if he knows true power, declaring that he will destroy his descendant that ruined his plans before. Knuckles and Julie-Su investigate Mighty's house, which is in shambles, just like Espio's. Knuckles, investigating the debris, wonders if there is a pattern going on. Julie-Su jokingly states that she wished she was still an enemy of Knuckles at this time if there was a pattern, but he doesn't take the suggestion lightly, questioning if she is still a friend. She asks if she now has to take an oath of loyalty, then noticing him running out the door, telling her that they'll deal with it later. He runs off the cliff edge to head for the ground, so Julie-Su runs after him, grabbing his legs just as he flies off the cliff. He tells her to hang on as they glide down to the surface, while Julie-Su wants to know what exactly is going on. Unknown to them, Mammoth Mogul, with a Chaos Emerald, watches the two gliding down, saying to himself that the fun is about to begin. The two arrive on the ground, so Knuckles finally fesses up saying that he doesn't exactly know what is going on. What he does know is that whoever is dealing with the Chaotix has a lot of power, as their group can't be taken down so easily. Julie-Su, however, notes that they aren't the most perfect group around. Knuckles does agree that Mighty doesn't have the best technique, but his strength makes him a force to be reckoned with. They walk through some bushes, until a bright flash of light appears in front of them, sending them flying back. They get up and look into the bright light source in front of them, while Knuckles hears a familiar voice calling out to him from it. Recognizing Dimitri's voice, he calls him out, not afraid. Accepting the call, Dimitri as Enerjak appears, larger than normal, out of the light, telling Knuckles that his words are empty. Knuckles tells Julie-Su to run, but she has no idea where she could run or hide from such a being. Dimitri reaches down for Knuckles, noting that Julie-Su can recognize the danger he is in and that he can learn from her. He grabs Knuckles, telling him that he won't have the time to learn, laughing as he holds Edmund's descendant in his hands, while Julie-Su watches helplessly. Dimitri/Enerjak returns, last seen in issue 3 of the Knuckles mini-series. The telepathic link that Locke performs on Hawking is similar to the Vulcan Mind Meld from Star Trek.